Do most households have a place like this bench? A place where things are set “temporarily” until they can be put back where they belong? (And then they linger there, gathering dust, and friends, until the whole thing is so precariously balanced that something has to be done?) This pretty bench, made of elm, was purchased for $25 at a farmer’s market in Princeton (B.C., not N.J.) in the summer of 2010. 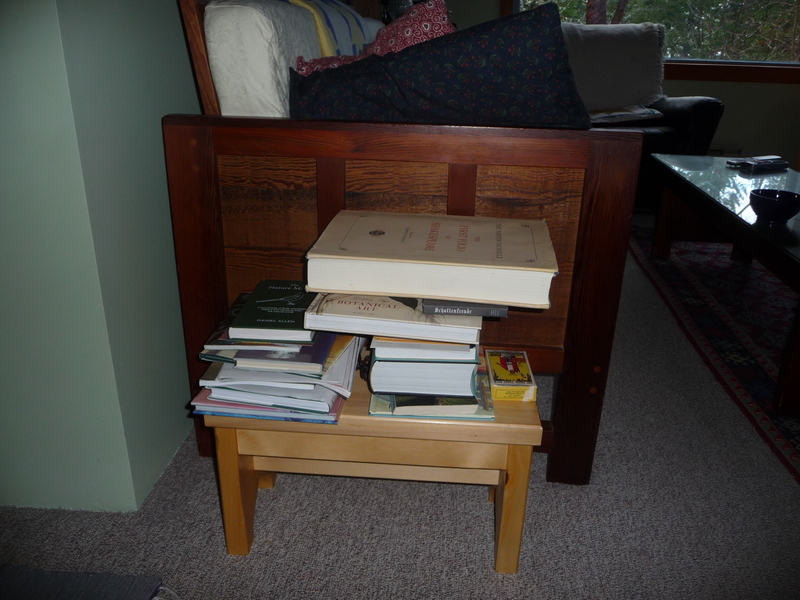 It’s become the place where books accumulate. On top you can see the Norton Facsimile of the First Folio of Shakespeare. On the weekend, our actor friend Jeffrey Renn was here for dinner and overnight and we — with friend Liz Young, also here — were discussing The Merchant of Venice. Jeffrey recalled something particular to the First Folio edition and (as it happened) I had the Facsimile so pulled it from my shelves. “Let’s look it up,” I said! (My children once said that this will be my epitaph, having heard it so frequently during their childhoods. I know there’s probably an app for that now but I love the physicality of books…) And the beautiful Golden Age of Botanical Art, a birthday gift from John, which had to removed (to the bench) from the coffee table on Saturday night so we could put out pre-dinner snacks for our guests. Anyway, I’ve just put the Fascimile back on its shelf. And underneath it was a little book I’d forgotten about. 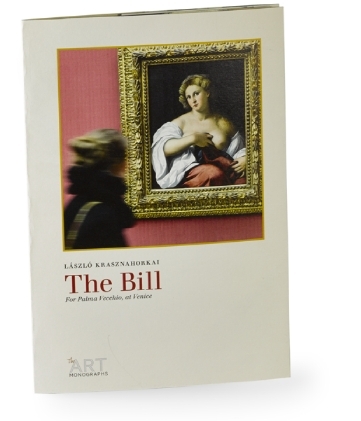 The Bill: For Palma Vecchio at Venice, by László Krasznahorkai. My friend Anik sent it to me in the fall. I’d read it then, for the sheer pleasure of its presentation — a 14 page single sentence, addressed to the 16th c. Venetian painter Palma Vecchio (also known as Iacopo Negretti), asking him about his method, his fierce eye, his relationship to the women he painted so sensuously all those centuries ago and who gaze at the reader from the pages of this gorgeous monograph, sewn (! ), with French flaps. This essay is translated by George Szirtes and the book is beautifully designed, generously set in 16 pt. Berthold Walbaum, making it a pleasure to read. How wonderful that Sylph Editions in London care enough about essays and other works that might not find such congenial presentations elsewhere. I’ve taken it from the bench and will find a more appropriate home for it on my shelves. But not until I’ve read it again. ~ by theresakishkan on February 17, 2014. Yes, it’s true, Beth. Books everywhere, papers “to file”, etc. I have such a place as well. It’s both unruly and exciting. This entry was posted on February 17, 2014 at 5:11 pm and is filed under Uncategorized.You can follow any responses to this entry through the RSS 2.0 feed.You can leave a response, or trackback from your own site.